My daughter and her friends were making plans to see FROZEN the Movie for weeks. my daughter was already in L-O-V-E with Anna and Elsa and Olaf! Well, my little girlie was one lucky little girlie. Not only did she get to see the movie with her Mommy and Daddy that weekend. 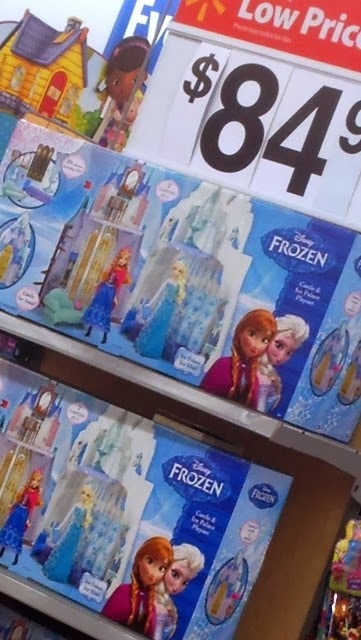 I also had the opportunity to take her shopping at Walmart to add some fabulous FROZEN toys to her "collection." and we even headed out to brave the holiday shopping crowds. We had the best time on our shopping trip, which also turned into a lunch date. This Walmart has a Subway (which we love) and we discovered that at Subway's in Walmart you could not only get a cute reusable FROZEN bag, but there was also a FREE FROZEN Olaf Backpack Clip with the purchase of a FRESH FIT FOR KIDS meal! That deal is happening through January 6...and you can only get it at Walmart! Then it as time to hit the toy aisle! There was a lot of "Look at that Mama!" coming from my daughter! 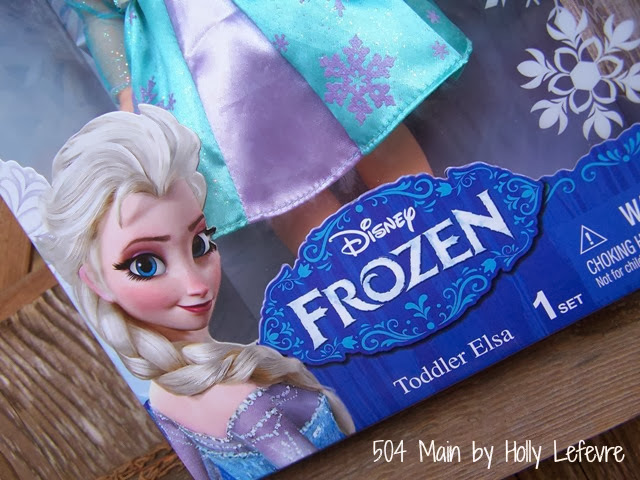 The FROZEN merchandise is so cute....and Jules was beyond excited! We saw the FROZEN Castle Play Set first. Boy did her eyes get big! 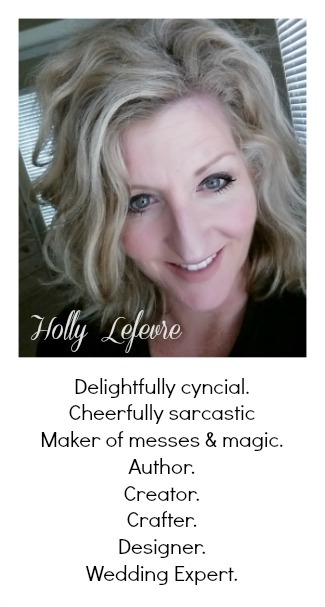 I suggested that go on Santa's list! Before we went shopping we decided that we would be purchasing some FROZEN toys for her to keep AND some toys to donate to the Toy Drive at her school. Sven, Olaf, Anna, Elsa - oh everyone was at Walmart to greet us! but I also found a plush Olaf and Sven in the toddler aisle. The Musical Magic Anna and Elsa dolls caught my daughters eye - of course they did! 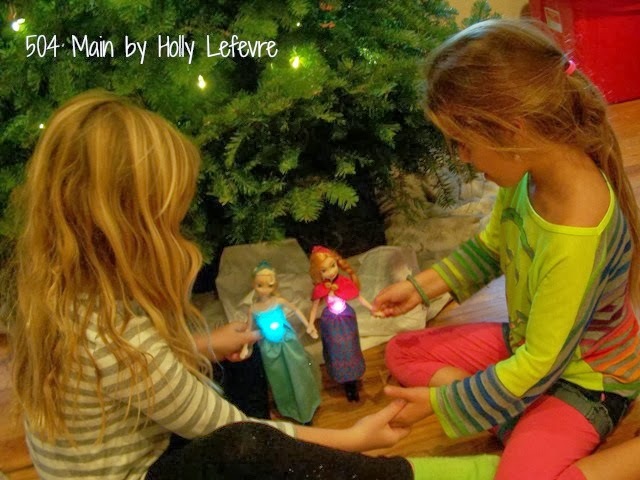 These dolls sing and light up when they hold each others hand or my daughter holds their hands. We also purchased the Elsa Toddler Doll. My daughter loves this Disney dolls, so I knew that would be coming home with us, before she even asked for it. We rounded out our shopping trip by purchasing a few FROZEN puzzles in metal lunch boxes and a doll to donate to the Toy Drive. I thought it was important to do this, especially at this time of the year...and it was actually my daughters idea! She was very proud to donate these toys when we went back to school. I was proud of her too! 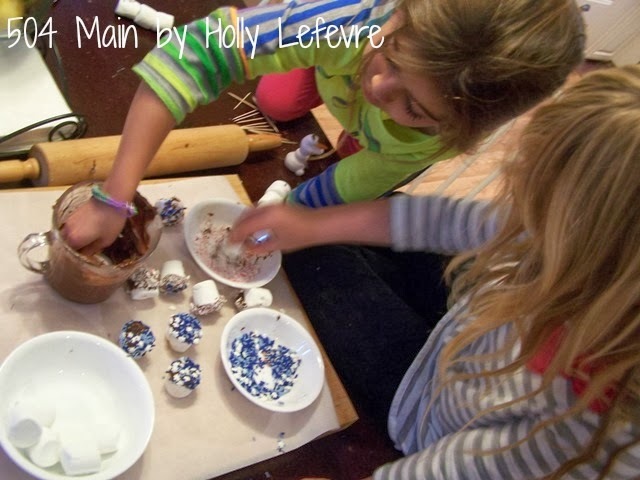 my daughter wanted to invite a friend over for a playdate...and she had ideas for this playdate! She wanted hot cocoa, chocolate covered marshmallows, and snowman mugs. I was feeling inspired and crafty, and thought...let's go for it! 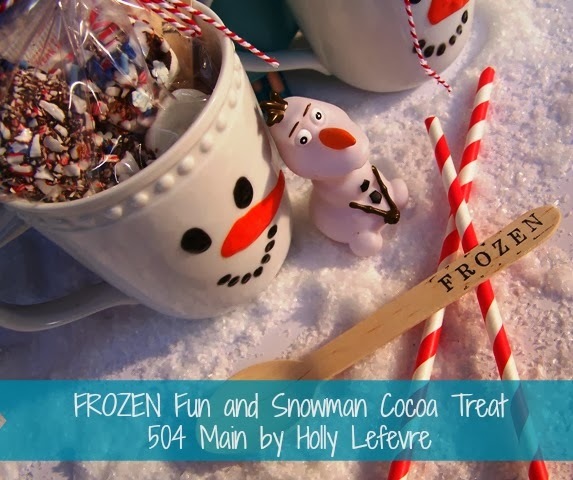 We created these FROZEN inspired Snowman mugs filled with hot cocoa and goodies. 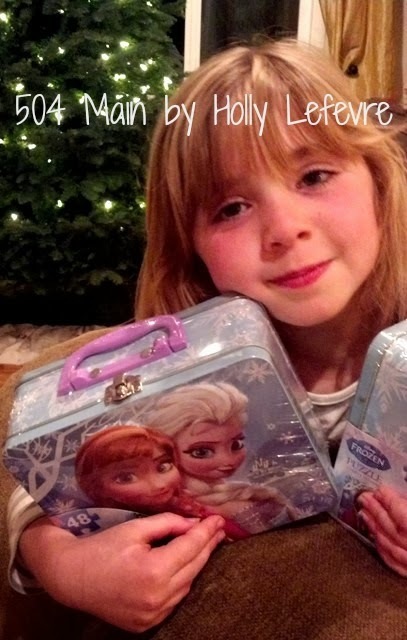 It was really easy and fun to pull together and this would make a fun holiday gift for every little girl who loves FROZEN. It was super simple to put this treat together! Clean you mug with rubbing alcohol and a cotton ball. Hold the mug with the handle on your left (this leaves the face pointing outward if you are right-handed when you drink). 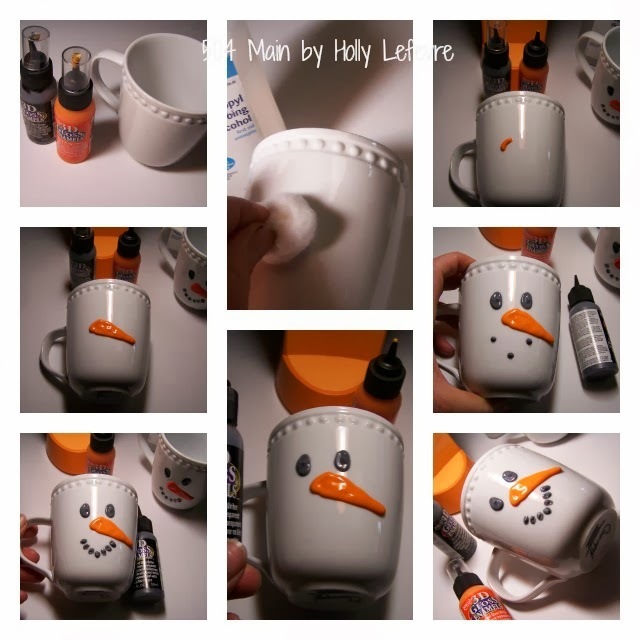 In the center, make a half moon with your orange gloss enamels and then freehand a crooked carrot nose (there is no right or wrong...it gives the snowman character). Fill in the outline with the gloss enamels. Make two simple eyes in the graphite. For the mouth, draw in whatever shape you want...I just did a basic smile using elongated dots. Let the paint dry for 48 hours. Bake at 200F for 30 minutes in a non-preheated oven. but Olaf is one of a kind...so I just decided on a regular snowman. 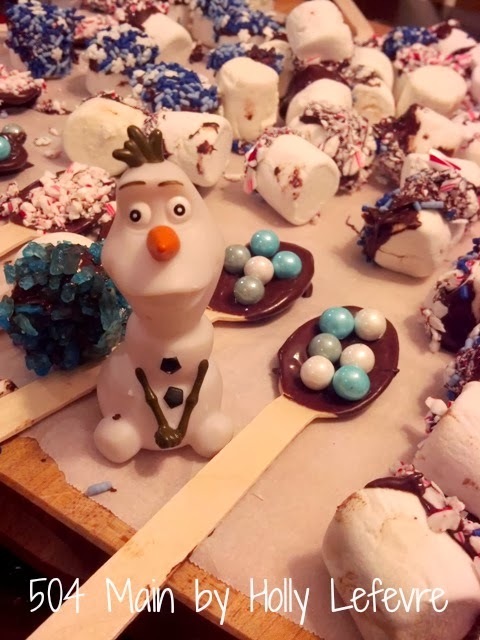 Then Olaf helped make Chocolate Covered Marshmallows! Package in the treat bag. The girls loved doing this! 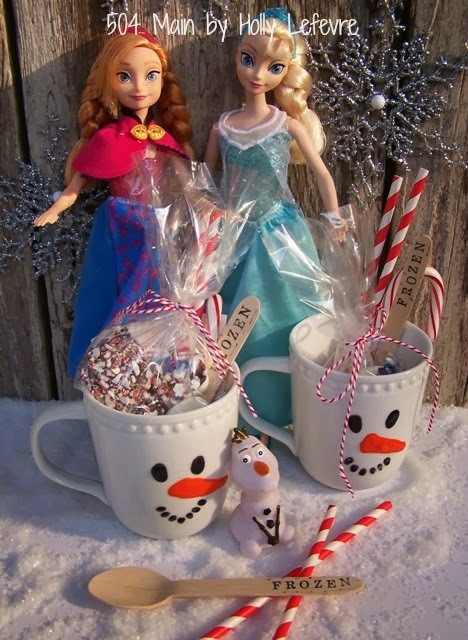 Carefully place the fun cocoa treats into your adorable FROZEN Inspired mug. Then of course you need to play some more! 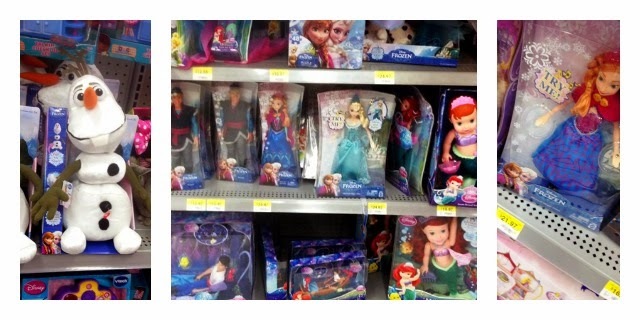 FROZEN mer­chan­dise can be found at Wal­mart. by following along on Face­book, Twit­ter, and the offi­cial FROZEN web­site! So adorable! I love the mugs!!! Did you get the white mugs from Wal-Mart also? I love that Olaf helped make the marshmallows! I was also in love with that ice castle! We are itching to go see Frozen! Those mugs are ADORABLE! The mugs are too cute for words. My little guy wants to go see Frozen ~ hopefully we'll be able to go over the Christmas holiday. OMG How cute are those mugs? What a fab idea. I took the kids to Frozen over break... such a great film! I'm thinking I may need a grandma party, old people like Frozen too! Those mugs are adorable! 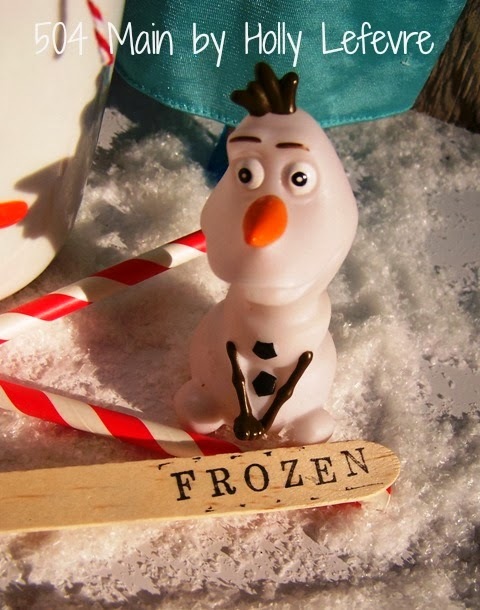 My daughter's birthday party next month is Frozen themed, so I may have to make these as favors for the guests! My kids are DYING to see that movie!! Ah! My girls would go insane for those dolls! They are 100% obsessed with Frozen! And LOVE the mugs, so cute! How cute!!! Those mugs are adorable!!!!!! Oh man....those mugs are ADORABLE!!!! You're so creative! The cocoa and mugs both look great! Love the mugs and the cocoa! So creative! I love the olaf mugs. and i regret not getting the elsa baby doll. may have to run and grab it today! Oh my gosh, the mugs are SO cute. One of my fave little gifts to give is a mug with hot chocolate like that, but this is so adorable and personalized. Fantastic idea! Aah! Those are all so cute!! Love the mugs and marshmallows!